Tiles. Tiles, as generally used, are of two kinds," plain" and "pan." 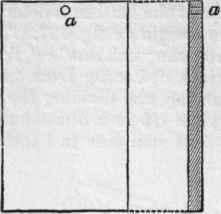 The "plain" is flat, rectangular in outline and in section, as in fig. 430. These tiles are secured to battens a a, fig. 431, nailed to the rafters b b by wooden pins c c, which pass through the hole a, fig. 430, at top of tile. The tiles, like the slates, are made to overlap each other, and to break joint. 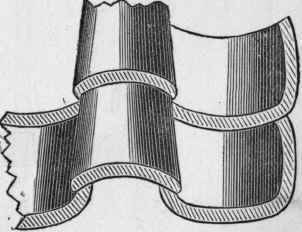 The "pan tile" is in cross section, as at a, fig. 432, in elevation at c, and in longitudinal section at d. These are hung, so to say, to the battens a a, fig. 433, by the projecting piece b b (d in fig. 432), which is made on the lower face or bed of tile. Ornamental tiles are now made of various forms, some with their lower edges formed of semi-circles, some lozenge-shaped. In figs. 434 and 435 we show two forms of Continental tiles; in fig. 435 a small ridge a or fillet, tapering to an edge, is placed on the upper side of the tile, which gives great strength, with thinness, and adds to the appearance; the shape of this tile is lozenge, that of fig. 434 square, placed diagonally. Fig. 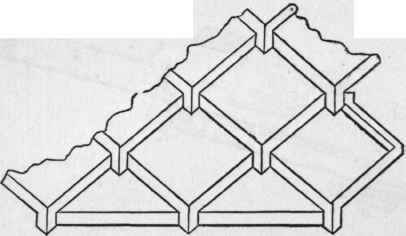 436 shows the " bridge tile." Captain Fowkes, who gives them in his official report on the Paris Exhibition, also describes a form of tile made by Messrs. Muller & Co., of Paris, which enables cast-iron light frames and sky-lights to be inserted at any part of the roof with great ease. In fig. 437 the tile in longitudinal section is shown, the upper part of the tile is made as at a, the lower part as at b, this going into the recess at c (shown on a larger scale at d e f). 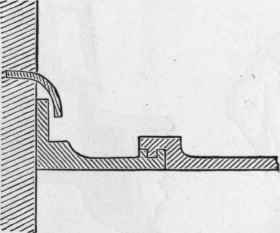 The joint longitudinally is shown at g, which is the lower part of one tile, this being furnished with a projecting part which goes into a hollow in the bed of the next tile lower down, as h. The cast-iron frame of the skylight is at i i i, and the easy way in which it is fitted to the tiles is there shown; k is the light or glass frame held open by the catch I. Fig. 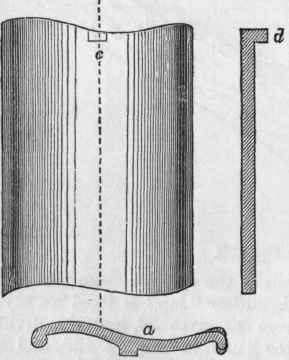 438 shows a flushing tile made by the same firm and on the same principle. In fig. 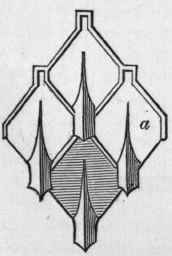 439, a is a form of ridge tile, b do., but used to terminate the ridge, both being made by Messrs. Johnson & Co., of Ditchling.